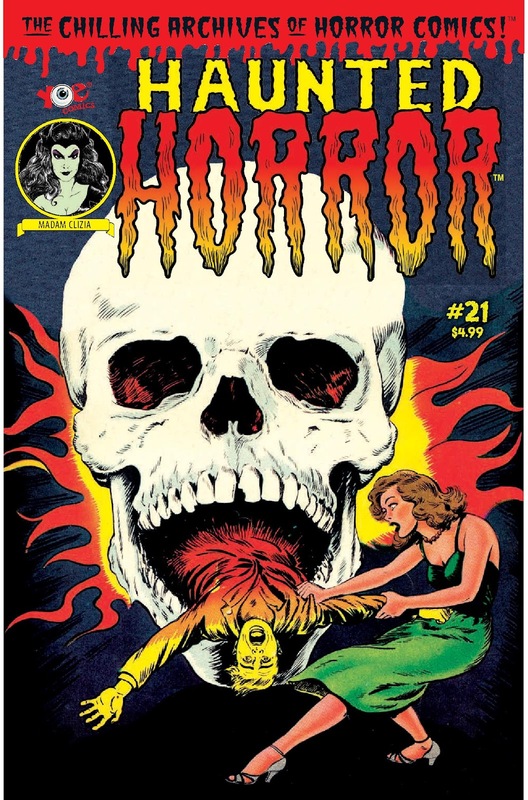 The Fellowship was fortunate enough to obtain a copy of HAUNTED HORROR #21 from IDW Publishing and Yoe Books. The art for the stories are by Harry Lazarus, Gene Fawcette, Manny Stallman, John Giunta, Mike Sekowsky, Mike Epps, Charles Nicholas, the Iger Shop, Mike Esposito, and Unknown. No writer credit given. “The Eyes of March!” - Laura Duncan wants to leave Nicholas March to be with her love Johnny Franklin. But can they can get away from his haunting, always present, eyes? “Case of the Haunted Girl” – When Esther Carr refuses to marry Bob Nelson, he kills himself. Now she (and the town of Glarno) are haunted by the spirit of the scorned lover. “The Subway Terror” – A patrolman discovers a dead body in a subway tunnel…and a secret the police have kept for several years. Thank you Yoe Books and IDW to making it possible for these gems see the light of day again. These are great little horror stories with solid visuals. This series is a must for any fan of horror or someone wanting to read comics of yesterday. HAUNTED HORROR #21 is in stores now, or available for ordering at www.idwpublishing.com.